I've been to Cineplex in Singapore once in a while when I visited Singapore. It was good and I pretty much enjoyed most of the time there. But I've never been to Cineplex in Phnom Penh until today. It is on the 5th floor of Sorya Department Store. 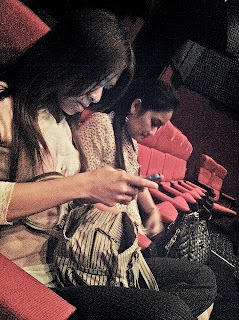 Because I can't wait any longer to see Twilight-Breaking Dawn, I went straight with my sister and friends after work. We could steal a minute or two to stop our stomach from growling, anyway. so how was the cinema like?